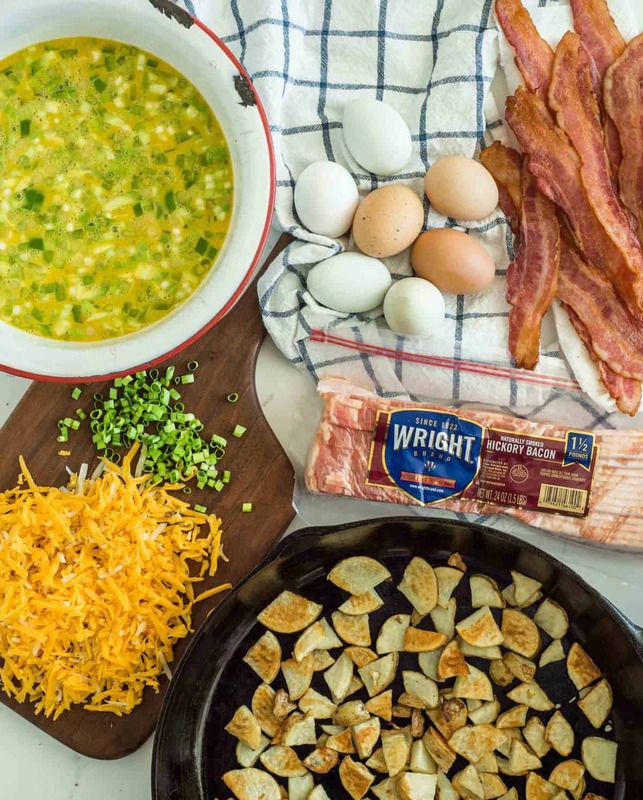 Cheesy Bacon and Roasted Potato Egg Casserole is easy to put together and a perfect one-dish wonder that you can serve for breakfast, brunch, or dinner. When you have backyard chickens pecking around outside, you also tend to have a lot of eggs floating around inside. I’m always coming up with new simple egg casserole recipes because we have a lot of eggs to eat! 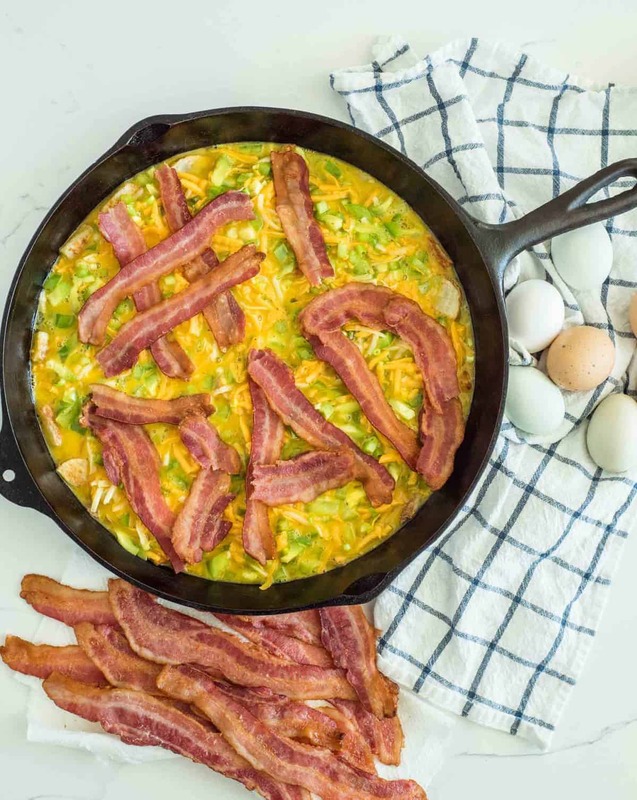 This recipe would be perfect for Father’s Day to help you celebrate those you love in your life, because nothing says ‘love’ like bacon, amIright? 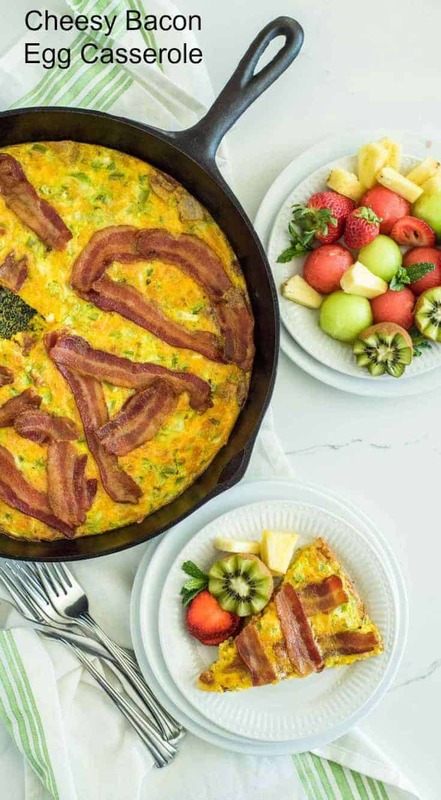 It’s one of those classic bacon, potato, egg, and cheese dishes that everyone loves no matter who they are, and you’ll love how simple it is to put together. Today I’m working with Wright®Brand Naturally Smoked Hickory Bacon and I couldn’t be more excited about it. Wright Brand sells the best thick-cut, hand-trimmed, and naturally smoked bacon on the market. When it comes to bacon, this is the cream of the crop. It cooks up beautifully and has just the right amount of smoky-goodness to it. We love this product and really like to get it for celebrations like Father’s Day. Roasting the potatoes ahead of time might seem like an extra step but it adds a great flavor to the dish. I’ll often cook up double the amount of potatoes needed and serve the other half on the side like home fries. Delicious. The thick cut bacon is so good in this recipe! When you leave it on top, it crisps up a bit in the oven and is so delicious. The full strips on top slice up great for serving. 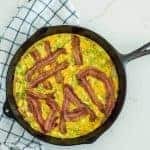 Since the recipe calls for half a package of bacon, I’ll often cook up the whole package and serve the other half alongside the egg casserole. My family is never sad to have extra bacon on the side. You can use sweet bell peppers that are red, yellow, or orange in place of the green bell pepper if you prefer. The type of cheese that you use is up to you. I like to use a sharp cheddar. It’s also great with a Monterrey jack or pepper jack cheese. This can be a stand alone dish with a side of fruit. 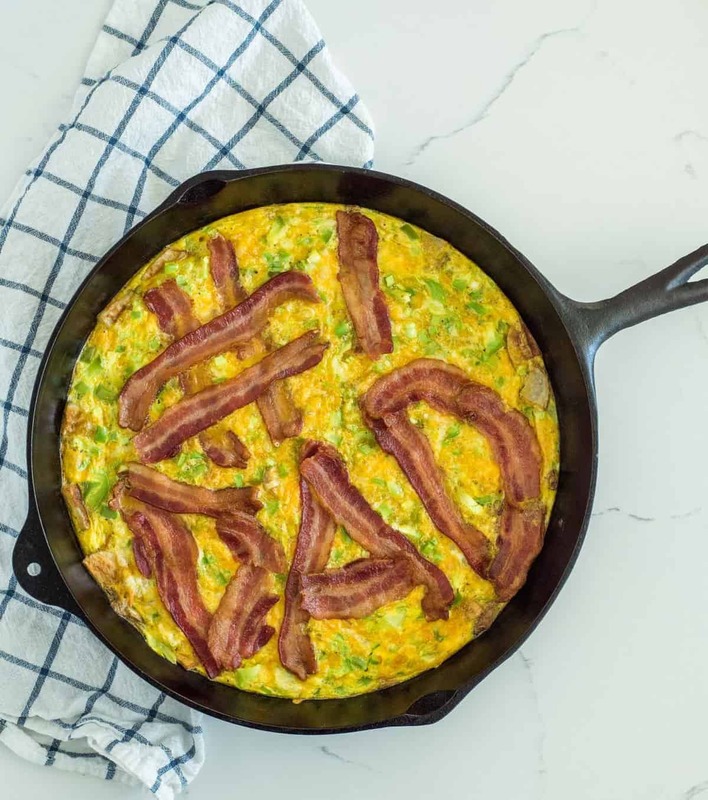 If you are celebrating something like Father’s Day though, you might want to add something fun on the side like the best butter biscuits ever or homemade blueberry muffins. Both are great choices. Where do I buy Wright Brand Naturally Smoked Hickory Bacon? I bought mine at the St. George, Utah Albertsons. You can find it at your local Albertsons location or in Albertsons banner stores (like Vons, Safeway, and Lucky’s). It was located in the refrigerated deli section (and there’s also a Wright Brand Applewood Smoked Bacon that we really, really like too). I love that there is a full pound and a half of bacon per package. You can snag a coupon for $1.50 off when you buy any TWO (2) participating products. Download your coupon here. Wash the potatoes. Use a sharp knife to cut them in half length-wise, and then cut each half in half so that you end up with 4 total pieces. Chop the potato wedges into 1/4 inch thick slices – no need to peel the potatoes. Add the chopped potatoes to a medium bowl and add the olive oil. Toss well. Spread potatoes in a single layer on a rimmed baking sheet. Bake the potatoes for 20 minutes until the side touching the pan starts to brown and the potatoes are cooked through. Remove from the oven and add a sprinkle of salt. Arrange Wright Brand bacon on a foil-lined baking sheet (I used two pans to cook the package). Bake until the bacon starts to crisp (but isn’t too crispy – you’ll be putting it in the oven for a second time). You can bake the potatoes and bacon in the oven at the same time if you have room. In a medium bowl, add eggs and whisk until well-beaten. Add the chopped bell pepper and green onion, cheese, and salt and pepper. Whisk to combine well. Grease a 9×13-inch baking dish or a 12-inch cast iron skillet well. Add the cooked potatoes in a single layer on the bottom of the pan. Place the cooked bacon on top (you can spell something like I did in the photos, place it in strips, or cut it into chubby pieces and sprinkle it evenly over the top). Bake for 25-30 minutes until the eggs are puffy, the top starts to brown, and the eggs are set in the center (you don’t want it to jiggle in the middle if you shake the pan a little). Remove from the oven and let the dish rest for 5 minutes before serving hot. The thick cut bacon is so good in this recipe! When you leave it on top, it crisps up on a bit in the oven and is so delicious. The full strips on top slice up great for serving. 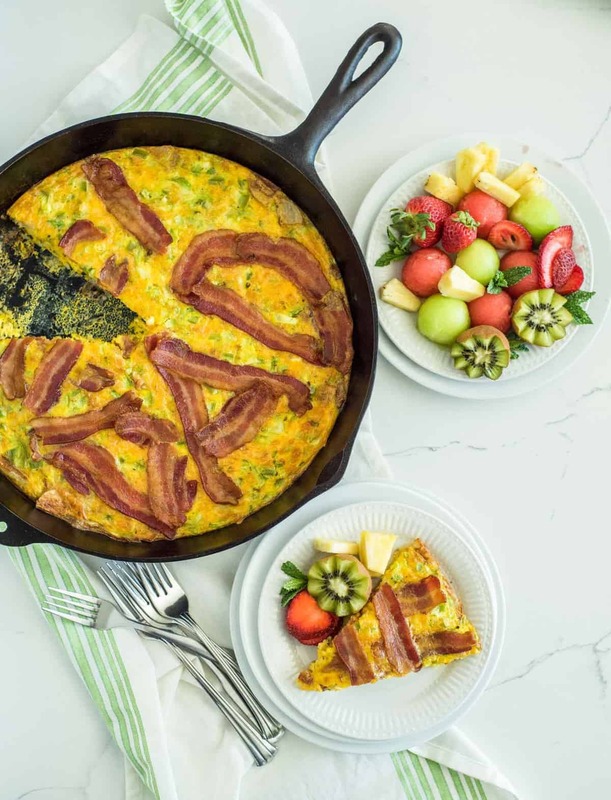 Father’s Day or not, this Cheesy Bacon and Roasted Potato Egg Casserole is going to be a hit for weekend breakfasts, slow brunches, and tasty dinners. It’s one that I make over and over again and I can’t wait for you to try it. Enjoy from my kitchen to yours, and thank you for supporting the brands that I thoughtfully choose to work with.